This case study covers the implementation of a Kanban system for a more complicated range of products – the steps leading up to the implementation are described as is the change management process. The information presented has been desensitised - the company and its products are not identified for confidentiality reasons. The company, which we will call XYZ Ltd, is a division of a global concern. It produces a range of complex and sophisticated electro-mechanical assemblies, employing over 200 people. There are 15 live products of similar overall appearance but with different sizes and different functions. Demand is not equally split between the products. There are 8 sub-assembly lines feeding one common process (which we shall call the gluing line) from there on to 6 calibration/testing stations. The sub-assembly lines are roughly split by product size, but also include new lines where new products have been developed and installed. 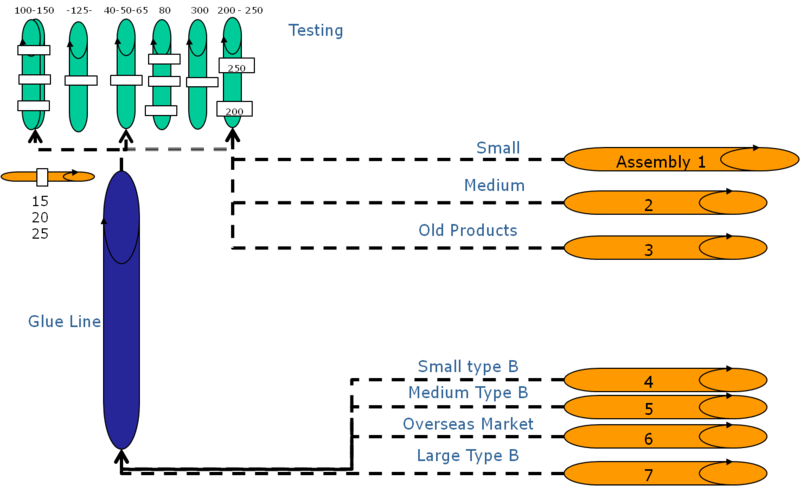 The test lines are also split by product size and age. The gluing station is not particularly complex, but all the products are glued. The glue typically takes 36 hours to set. A series of roller tracks holds the products waiting to set before testing. Sketch below shows a schematic of the process flow. Leanpal got involved with the project because the overall productivity of the factory was deemed to be too low. Throughput was less than expected, and the products were not coming off the lines in the expected order for the end customer. The initial project was scoped as an exercise to improve the throughput of the calibration/test department, where it was thought that the changeover time (taking products off the test stations and replacing them with the next product to be tested) was constraining the overall output of the factory. The supervisor of the calibration/test department, whilst open to the improvement project, maintained that the changeover time (and his department) was not the bottleneck - it was the way that the products arrived at the department which held up the overall throughput. This was quickly investigated and found to be true. The calibration and test was split into different product families, and could handle up to 11 assemblies any one time across six test lines. In practice large amounts of the same size product were presented to the calibration test department at the same time. Never mind waiting for a bus and three turn up at once – a better analogy would be like waiting at a main line rail terminus in London only to find that the first 30 trains were all going to Wales, the second 30 were going to Scotland and the third 30 were going to Cornwall rather than 1st train : Wales 2nd: Scotland 3rd: Cornwall 4th: Wales etc. The planning system already in place relied on line supervisors constantly scheduling and re-scheduling according to the master plan, without taking into account the queuing at the common process. Assembly lines were also manned by individual teams who concentrated on optimising their line performance without being aware of the bigger picture. This meant that labour transfer to meet demand across lines was rare and expediting critical items through production was frequent and disruptive (one senior manager spent almost all of his time on this activity). Leanpal advised the senior and middle management that a Kanban system throughout the factory could increase throughput and conformance to customers’ schedule by better ordering the presentation of assemblies to the calibration/test department. Value-stream mapping exercises were carried out across three of the eight assembly lines to improve the line layout, task balancing, single piece flow and pull production within the assembly lines themselves. It became apparent that despite the scheduling carried out by the line supervisors, assembly teams took it upon themselves to change the plans dependent on their personal build preferences. The tail was wagging the dog. Not only were the products’ arrival at the gluing station not being coordinated, the assembly of the products within the 8 lines were not being carried out in accordance with the plans. Value Stream Mapping also revealed that the opportunity for significant productivity savings through task balancing within the lines, not to mention across the lines. The overall production demand pattern was analysed using Pareto analysis, and broadly split into runners, repeaters and strangers depending on the volume of throughput. A “model plan” was developed to explore how the runners repeaters and strangers should (in theory) be presented to the gluing line in order to optimise the delivery of finished assemblies to the calibration/test lines. Kanban cards were designed and pre-printed for the runners and repeaters. Blank Kanbans for the strangers allowed the product name or specification to be handwritten into the Kanban. It became clear that two Kanban loops were required – one between test & gluing, plus one to pull products from assembly to the gluing line. The system was designed so that only the test supervisor received a copy of the customer orders to be processed. 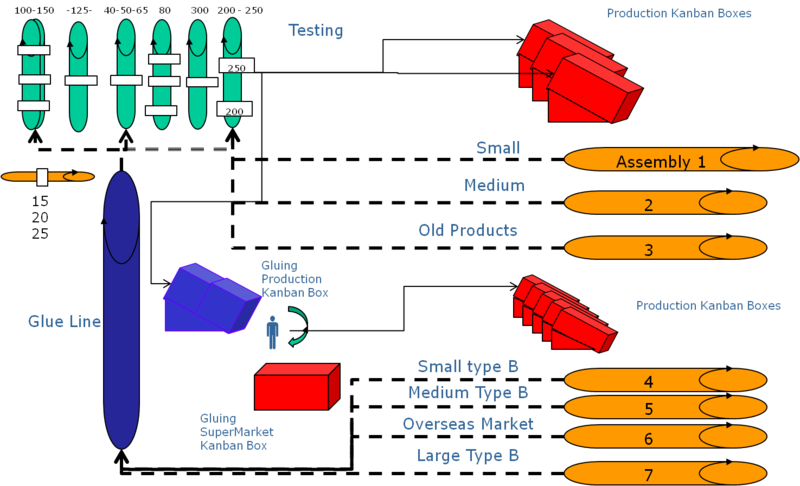 As runner/repeater products passed testing, the (blue) Kanban cards taken off these products were placed in the back of a Kanban box situated close to the gluing line. This triggered a differently coloured (red) Kanban card to be sent to the eight individual assembly lines, each of which had its own Kanban box. The red Kanban card signalled the assembly line to build the product, the build order was dictated by withdrawing the card from the front of the box. The products assembled with red Kanban cards reached the gluing line, the red cards were replaced with blue cards, then the red cards were filed in part number order waiting for the next call off. Staff on the gluing line were responsible for matching the assembled products with the blue Kanban cards in the order dictated by the cards coming out of the bottom of the (blue) Kanban box. This ensured that the products going through the gluing line were processed in the order required by the testing station despite the 36 hour lag time as the glue hardened. The whole process significantly improved delivery measured by OTIF (on time in full) by smoothing the flow through the gluing and testing processes. Due to the visual nature of the Kanban cards, where assembly lines had no product to be pulled, the supervisors found it much easier to manage the movement of assemblers to different assembly lines where the products were required. The implementation of the Kanban System represented a significant change for the assembly line personnel. They were used to managing the pace and order of their own assemblies according to their preferences, and generally stuck to one particular type of assembly rather than crossing line boundaries. Night shift and day shift competed on assembly numbers by attempting to produce the easiest products rather than the ones which were actually required by the customer according to the schedule. Individual line and shift targets set by management had encouraged this behaviour in the past. The installation of the Kanban System smoothed the overall flow through the factory, but forced the assemblers to build strictly in the order required by the customer, and to be flexible between easy/difficult products and across the production lines. The design of the card system itself, the Kanban boxes, and the need for strict discipline in terms of ordering the Kanban cards was also a significant change. In order to address this culture change, the complete system was extensively modelled with stickle bricks representing products, card labels standing in for Kanban cards and cardboard boxes standing in for the Kanban box. Initial table-top simulations were tested by a small team of four managers and production engineers. Then glue line, assembly line and test line supervisors were taken through the simulation to model the process and deal with any questions. Having proved the system worked through the simulation, real Kanban cards and boxes were produced and installed on the factory floor, flow charts and standard operating procedures were drawn up to explain the process and awareness sessions were run for all the shop floor personnel to explain the system. The installation of the Kanban system took several months to design and develop. Whilst the concept of Kanbans is relatively simple, the devil was in the detail : understanding the demand pattern, where the issues were and how to design the practical application. Understanding lean and the overall picture needed to be developed across senior management, middle management and shop floor staff. The project would not have succeeded without significant application of resource from the company to analyse the detail and adapt the system into something which would work within the company. Nor would the project have succeeded without a strong management champion capable of seeing the big picture and committed to addressing the whole rather than fire fighting individual departmental issues.